Tomorrow I will be speaking at St. Victors in San Jose with Gene Yang, if you’re around please join us. I had every intention of completing this drawing of our family dancing. Some of our best days are when the hubbahubba puts on a record and our daughter demands that we get up to dance (mostly to chaiyya chaiyya). Like many things this year, though, I did not have enough time. So I share it in its raw sketchy state as it still captures our joy. It’s been a strange, exhausting year. Aside from sharing PASHMINA across the country, creatively the best art I shared were my free resistance coloring pages. Most of my other work I cannot share yet. 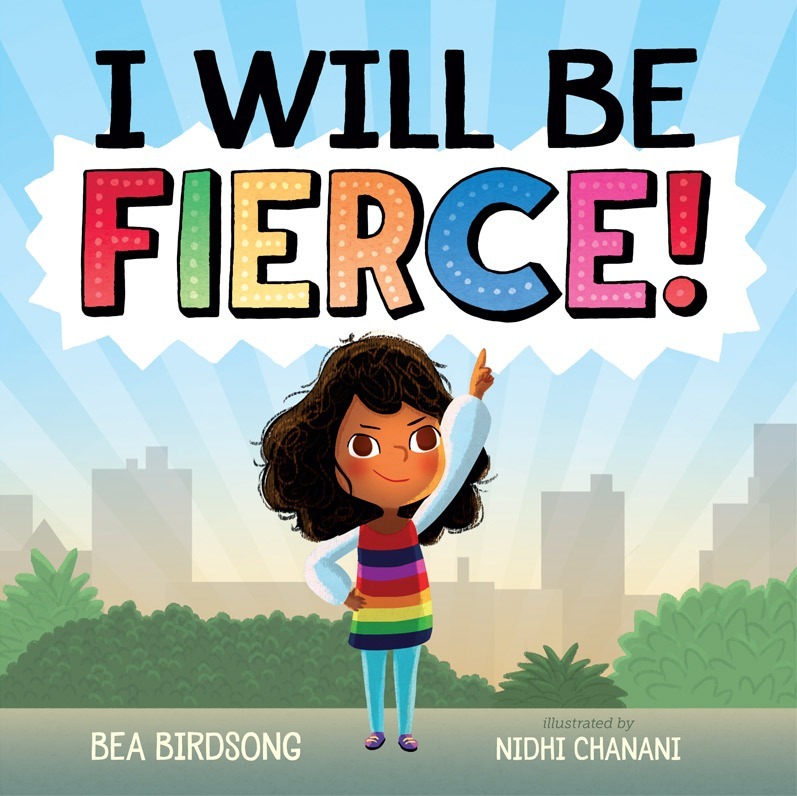 In fact one of my projects, a picture book titled I WILL BE FIERCE was just announced. For the first time in my years of working independently, I am taking 2 full weeks off for the holidays. Not working late on Christmas eve, not missing catching up with friends and family and taking a much needed mental break. Thank you for all your support & shares. I hope you have happy, warm holidays. My theme for inktober is fall favorites. If you have a fall favorite you’d like to see my draw, leave a comment and I may draw it! One of the things I enjoy the most about the inktober challenge is using color in harmony with the ink. I realized that if I don’t ink the outlines of all the elements (in this case the leaves), I can give the appearance of a foreground and middle ground. That means that the ink can pop forward and the color, even though its everywhere, has a more subtle quality. I recently did a set of commissions and loved how thehubby described their cooking sessions – he made the food while she snatched samples along the way! Ive been asked about my process for awhile so I thought I would create a short gif to give some insight. I begin in flash with a line drawing, then I draw over that with solid color. I export my flash file in layers to photoshop and add shadows, lighting and adjust the colors.I hope you have a happy week! Meanwhile, this weekend I will be at the Urban Epicurean Fest in San Francisco selling prints, cards and calendars with the wonderful Lyla Warren ofLittle Brigade. She’s coming from Portland to share her lovelySeedlingswith you all! If you’re around please come by and say hello! I’m back in the studio after a 2 month break to be with my daughter. It’s the longest break I’ve had from art in 5 years! My biggest project is working on the final art for my graphic novel, Pashmina. As I opened my completed pages I noticed my main character, Priyanka, looked different in a few panels. I started to worry that I wouldn’t be able to keep her consistent throughout the book. As I revised the panels that bothered me, I thought about how much work isn’t seen by the reader. There’s so much pre-work – sketches, notes, ideas, drafts. Through the next few months as I work on final art I want to share some glimpses of the pre-work with you. As I worried about character consistency, I pulled up a file with a bunch of Priyanka expressions I drew during the thumbnail process. This exercise not only gave me an idea of her personality, but also how to draw her face up, face down, and from the side. Once I brought this file up, I felt calm. I already did the work that could help me with consistency. I use the file for reference through each page. This is my first attempt at a graphic novel. The whole process is a learning experience. By the time you hold a copy in your hands, each page will have been revised, redrawn and edited at least eight times. The manuscript had five drafts. The thumbnails had three rounds of editing. The final art will no doubt have at least two. Some pages are easier than others. I’ve read about other creator’s processes in writing and drawing. I’m sure I’m doing things wrong and I know I’ve made lots of mistakes. I’m okay with that. Once I finish, I will know what works for me. For now, I must push forward, making mistakes and learning along the way.